Posted 9/30/2013 7:12pm by OONA COY & BEN JAMES. Tomatoes are winding down. Eggplant is winding down. Green beans are winding down. And even the campaign to fund Tuesday Market's FoodStampsX2 through 2014 is winding down. This week is your last chance to donate (through indiegogo) to this amazing program, which extends people's buying power for fresh local food by doubling the value of their SNAP benefits! For lots more information and/or to donate, click on the image below. And even though tomatoes, etc. are on their way out, there is plenty of great food still to come. This week's broccoli will soon be followed by our fall cauliflower, cabbage, and what looks like a stellar crop of brussels sprouts. So come by market and check out what early autumn has to offer. We'll see you there! Posted 9/23/2013 11:28am by OONA COY & BEN JAMES. Hi everyone, I am selling three kinds of pumpkins at market from 3:30 to 4:30. I grew them on a planet. I’ll be next to poppas stand. OK not to mention broccoli, green beans, winter squash, greens galore, and the close-to-the-end-of-the-season tomatoes. See you there! Posted 9/9/2013 7:18pm by OONA COY & BEN JAMES. Oona's baked a pie. The boys have baked a pie. Our whole house smells of peach and plum and sugar right now. Come join us for the Pie Contest at Tuesday Market tomorrow, and share some of the pie-love. At our stand you'll find the first delicata and butternut squash of the season, along with the rest of the late-summer bounty. We'll have several boxes of canning tomatoes, too. Come early if you want them, or text me at 413 262 5489 if you want me to hold them for you. Posted 9/2/2013 4:34pm by OONA COY & BEN JAMES. along with one or two vegetables, of course. Posted 8/26/2013 10:29am by OONA COY & BEN JAMES. of course, and thanks to Claudia for so elegantly reminding us of this fact. Witness Mac weeding tomatoes in his bountiful garden, while the hens cluck their way around the coop that Darin built for Claudia in his driveway while the boys and I stopped by on our bikes to say hello to Stella before she made her way down the Town Farm gravel road to Farm Hands School, perhaps stopping a moment to watch Jim & Dora's cat Ophie prowling the weeds for a morsel of a mouse. And here's Ed, come in his white truck to report the goings-on in the Meadows, where he sat reading the paper this morning, next to the field he grew up working on, and where we now grow such tomatoes as this one, which you can come pick up this week at Tuesday Market, if you think you can handle it. Yes, tomatoes are at their peak, but luckily they'll still be around for a good several weeks, unlike our heart-breakingly delicious cantaloupes, which you can only get for this week and maybe next, so don't blow it. Also, fennel is back, arugula is back, salad mix is back. 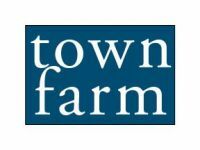 Good days at Town Farm. Posted 8/19/2013 8:07pm by OONA COY & BEN JAMES. It seems like summer's back for a bit, perfectly timed with the full on arrival of The Cantaloupes. Deep orange and delicious. Come on by our stand at Tuesday Market this week to smell them, look at them, taste a sample, and take one home with you. As Ben cut one open for this picture tonight, I looked in at the caverns and could only think, "What a lovely seed vessel." I have two slightly cracked melons on my kitchen counter waiting for me to make some Cantaloupe Tarragon ice pops. Here's the recipe from People's Pops in case you're inspired. Combine the simple syrup and tarragon in a small saucepan. Cover and bring to a simmer over medium heat. Simmer for 5-10 minutes, then turn off the heat and let rest while the tarragon steeps. You want about 3/4 cup or a little more to work with. Cut cantaloupe and puree in food processor. You should have 2 1/3 cups puree. Strain simple syrup making sure to squeeze out anything left in the tarragon. Mix with cantaloupe in bowl that can pour well. Pour into ice pop molds, insert sticks and wait 4-5 hours. We also have loads of tomatoes, carrots, beets, onions, garlic, kale and a bunch more. Posted 8/5/2013 3:26pm by OONA COY & BEN JAMES. If you look south from our house or from any of our fields what you see is the Holyoke Range rising abruptly above the Connecticut River Valley. The peaks that make up the range are not particularly high (as far mountains go), but still they are rather stark and anomalous and inviting in the way they're just there, in one long line, with no other mountains around them. Out in the meadows, where we're growing this year's tomatoes & peppers, and where Silas and I often take a bike ride with our dog Blue, the range is a powerful presence and a frequent source of conversation between him and me. Last week, we took advantage of a low-key Wednesday to do something Silas and I had been talking about for a long while. We hiked the Seven Sisters, that series of peaks between Mt. Holyoke and Bare Mountain, six miles of up & down terrain that, in total, comprise a 3,700' rise in elevation. From the various overlooks along the ridge we got to take in the whole valley. We could see the route we ride with Blue through corn & soyfields during heat-wave mornings when we need to get out of the house before 6am. We identified the church steeples of Northampton, the bridges spanning the Connecticut. Looking out over the many agricultural fields, I enjoyed the fact that I wasn't in any of them, and I almost made a comment about all the food being harvested, weeded, washed by our many farm friends across the valley (Silas would not have been impressed). In the midst of the bustle of summer, it was a pleasure to look down at our stitch of the world and have nothing to do with it at all. We ate blackberries and wild blueberries. Silas found a bluejay feather. We imposed ourselves briefly upon a frog and an inchworm. The hike took six-and-a-half hours, but it felt like we'd been gone a lot longer. It was a good day. Now, back in the bustle, I am just about to head out and harvest the first watermelons of the season. Hannah and Adam & Andrew are deep in the tomatoes (literally, since the plants are now over 12' tall). The fruits and leaves and roots are all hungry for our attentions. Come to market this week and share in the richness of it all. Can't wait to see you there. Posted 7/29/2013 6:12pm by OONA COY & BEN JAMES. "This is the best popsicle I have ever eaten," she said, and then I went and asked her to say it again for the camera. Posted 7/22/2013 6:33pm by OONA COY & BEN JAMES. The heat slowed us down last week, or maybe I should just speak for myself. I was moving slow, and most of the crops weren't doing anything besides looking wilty, and even the ground that we were prepping for fall broccoli & kale & cabbage was just lying there being cranky. But – amazingly – Hana & Adam, our principal crew members, were still running from field to field, still picking tomatoes in a 110-degree greenhouse, still operating tractors & weedwackers & irrigation pumps with sweat pouring over their eyes. We truly would not have any food for you all without these two, so please give them a big thanks when you see them at market. We're ready for some rain to fall, especially with all the new starts in the ground. And, of course, we know that a little precipitation couldn't keep you from market this Tuesday, where you'll find a summer treasure-chest full of green beans, tomatoes, onions, squash & cucumbers, cilantro, carrots, beets, and a lot more, including the last of the season's raspberries (come early for those). Posted 7/8/2013 3:48pm by OONA COY & BEN JAMES. Beet Chips – We use at least two and sometimes three bunches with each batch (they cook down a lot). Cut each beet in half and then slice it no more than 1/8 of an inch thick. Spread the beets out on one or two cookie sheets so they're not piled on top of each other too much. Toss with a couple tablespoons melted butter and a couple tablespoons coconut oil. Add salt and pepper. Bake at 400 degrees for about 45 minutes, until all of the slices have softened and some have gotten a bit crispy. Allow them to cool and enjoy! Raspberries are in full-swing. So are the green beans, and the green beans are very, very good. So many things are in full-swing that I don't think I can remember them all! So please, come on over to our market stand and say Hello, if not to us, then at least to the summer onions, the cherry tomatoes, the gobs of cucumbers and squash, the last of the sugarsnaps, and our awesome summer cabbage.